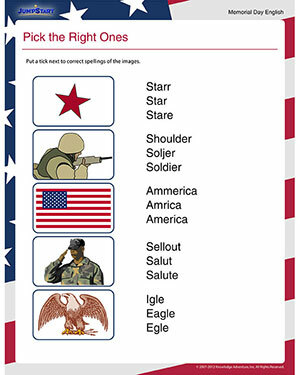 Pick the Right Ones is a simple and fun English worksheet for 1st grade. Get your little ones started on this to teach them how to spell words related to Memorial Day correctly. And with pretty images to go with them, this free and printable Memorial Day worksheet is quite a delight. Check out the other fun worksheets related to the holiday now!